After my father died a number of years ago, I realized how much I'd lost by not interviewing him and getting his stories and family history on tape. Immediately deciding to rectify this character flaw, I gathered together a small collection of note pads, pens and an old cassette tape player to make an interview kit. My wife and I were newly married and didn't have money for a bag to hold this collection, so I kept it in cardboard box. It remained safely in the box for several years until our first born was old enough to talk and I wanted to record her voice. That was the last time my 'kit' was together for a lot of years. Most of my aunts and uncles died before I again realized that all of their family history knowledge and stories went with them. How do you forget something like that? Especially when I started my married life with the right plan and had even assembled an interview kit. The answer is simple. I never used the kit. Never interviewed my parents and other older family members. Never acted on my 'good intentions'. When my mother passed away, I'd finally been kicked hard enough to get me to act on my plan. 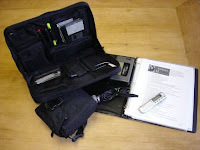 I assembled an interview kit and have used it many times since. The life stories and histories captured in my interviews are priceless to myself and to the family members of those I've interviewed. It is time for you to get 'off dead center' and interview your own family members. What do you need in your kit? You'll need to decide the answer to that question yourself, but I'll tell you what I have in my interview kit. 1. A case to hold the contents. I found one at a January sale at Eddie Bauer and it is perfect. It holds everything I need unless I'm video taping the interview. 2. A small cassette recorder. Get one that uses full size cassettes. Cassettes you say? In this digital world? You bet. High quality tapes are still the best storage medium for recordings if you take care of them. Don't toss them in a drawer with your other 'stuff' and fill them with dirt, heat and strong electrical fields or you might as well throw them away to start. Keep them in a storage box, up off the floor, away from children in a secure location. Use high quality 90 minute cassettes. They let you record for about 45 minutes per side (you'll need every second of that time once the person you are interviewing finally starts to talk). You can always buy a patch cable and digitize the interviews by plugging it into your tape player speaker jack and in your computer sound card input jack. Mini-RCA plugs on both ends... see Radio Shack again. All computer operating systems today have audio recorders built in them. 3. Spare tapes. Spare batteries. Spare video tapes. Spare pens and pencils. (Remember to rotate the batteries every six months or they will probably fail just when you need them). 4. A list of interview questions. I keep several pages of questions in sheet protectors in a 1/2" 3-ring binder along with a couple dozen sheets of paper. You'll need the questions to start the interview process and to help get you back on track when the interview goes far afield as they always do. Highlight the questions you want answered first and put colored marks by the questions that you also hope to fit in the session. You'll be very happy that you have the questions on your lap during the interview and surprised how blank your mind goes when you need to ask something intelligent about 40 minutes into it. I've posted two of my lists here and the 2nd one here. 6. A small directional microphone and stand. Don't frown, just get one. You want the sound coming from the person speaking, not all the sounds in the room, house and outside that are collected by the built-in microphone in recorders. If you ever forget to use one in your interview, you'll be sorry when you listen to your tape later. Who knew you could hear a truck three blocks away through walls? 7. Several pads of lined paper, post-it notes and throat lozenges, mints or whatever will keep the throats in the interview moist. 8. A tripod if you are using a video camera or maybe for your 35mm or digital camera. 9. A 12ft extension cord. Looking at the list, you'd think the kit weighs 50 lbs and has to be moved around on wheels. Not so if you keep your camera(s) in their own carrying bag. My kit weighs around 4 lbs and isn't much larger than a 2 1/2" 3-ring binder. How did the nursery rhyme go? "It is just right". I timed this note for early December so you'd have a chance to tell your sweetheart(s) that you know just what you want for Christmas..... the components of the Interview Kit and updates or purchases of your favorite genealogy software. In the week following Christmas day, practice interviewing your spouse, children, others with your new tools and immediately listen to the recordings. You'll quickly learn what questions to ask and how to control the direction of the conversation. Transcribe the interview and print copies for your family and your own family history storage binders. Way to go! You got it right and will always be glad you 'got off dead center'. Great article! Full of hard learned wisdom! I have been considering the purchase of a digital recorder but I am at a loss as to what to look for. How much space does the drive need to hold a 2 or 3 hour interview for instance? I would love for someone in the know to post an article devoted to this topic alone.